How are alternative fuels making greener cars a reality? The Honda FCX Clarity is the premier fuel cell car on sale today. 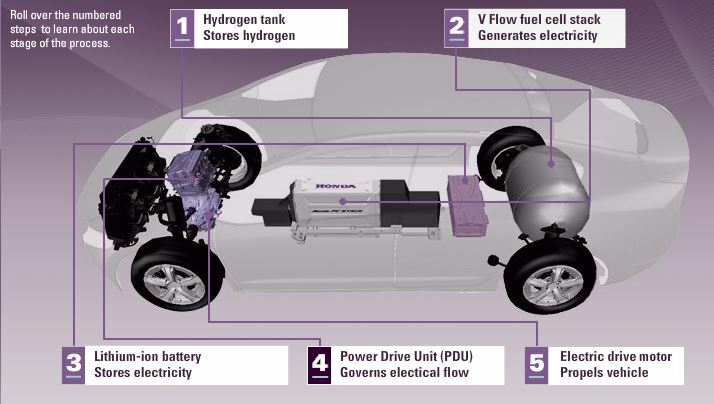 The fuel cell combines hydrogen with oxygen to make electricity. The electricity then powers the electric motor, which in turn propels the vehicle. Water is the only byproduct the FCX Clarity FCEV leaves behind. The Tesla Model S is the flag bearer for battery powered electric cars. Electricity charges a battery to give the Model S juice for a certain period of time, not unlike your smartphone or laptop. In fact, each Tesla electric car has much more in common with your MacBook than you might think — the company uses lithium-ion batteries just like the type that powers laptops worldwide. There’s just one difference — Tesla’s batteries are a heck of a lot more powerful. The battery in each Tesla car is actually made up of thousands of lithium-ion cells that have a combined weight of about a thousand pounds, according to the company. Each pack is built at Tesla’s Bay Area headquarters and comes equipped with a heating system that enables the car to function in cold weather. To get that battery ready to roll, however, you’re going to have to charge the sucker. Again, this process isn’t much different from the way you charge the portable devices you carry around every day — what’s unique here is you’re dealing with a much bigger gadget that carries you around instead. And this is the key difference between a Tesla electric car and a hybrid, like the Toyota Prius — it’s all electric and has to be charged, whereas the Prius runs partially on gasoline but doesn’t have to be charged. Now even though these technologies are extremely promising, some people prefer the longer range and peace of mind offered by hybrid cars that offer a tweaked internal combustion engine. But, as time progresses, fully electric cars and FCEVs will become increasingly efficient.